Teaching on Hebrews 8:1-5 regarding the Temple as a Shadow and a Copy of the supernal Temple above with references to Colossians 2:16-17 which describes the festivals and holy days as shadows of things that are to come–the substance of Messiah. While I don’t know how Lancaster approaches the passage you cited, one aspect that most folks don’t appreciate is that the background view is one in which the heavenly sanctuary and the earthly one are operating simultaneously in parallel, with the earthly one reflecting the operations of the heavenly one and receiving its authorization therefrom. The lack of this perspective also is responsible for a less-than-accurate English translation of the passage. For example, the word rendered as “change” can mean simply “difference”; hence what was intended as a comparison becomes falsely tainted with a sense of replacement. The encouragement offered in the Hebrews sermonic letter is that operations of the heavenly sanctuary continue to be effective even if those of the earthly one become unavailable, or are interrupted, or the sanctuary is destroyed outright (all of which occurred either just before or just after this letter was circulated). I hope you got the distinction being made in the aforementioned quotation. If not, read it again slowly and carefully. It’s important. Todays’ sermon is just loaded with great information so let’s get started. Lancaster began by quoting from Ezekiel 43 where we see the prophet being taken spiritually to the Third Temple that will exist in Jerusalem in the Messianic Era, effectively inventing time travel (at least according to Lancaster). Then he led me to the gate, the gate facing toward the east; and behold, the glory of the God of Israel was coming from the way of the east. And His voice was like the sound of many waters; and the earth shone with His glory. And it was like the appearance of the vision which I saw, like the vision which I saw when He came to destroy the city. And the visions were like the vision which I saw by the river Chebar; and I fell on my face. And the glory of the Lord came into the house by the way of the gate facing toward the east. And the Spirit lifted me up and brought me into the inner court; and behold, the glory of the Lord filled the house. God is telling Ezekiel that His Divine Presence will dwell in this Messianic Age Temple forever! God commands the prophet to describe the Temple he sees in the vision to the Israelites so they will be ashamed and repent of their sins. Why? Because it was their sins that resulted in the destruction of the Temple as it existed in their day, for Ezekiel was physically in exile in Babylon and the Temple in Jerusalem was in ruins. At this point in the sermon, I couldn’t help but think about how Judaism sees the cause of the destruction of Herod’s Temple as baseless hatred between one Jew and another. Rabbi Tzvi Freeman writes a rather lengthy midrashic description of this baseless hatred against the backdrop of recent events in modern Israel in the article The Tunnels That Rebuilt Jerusalem. Perhaps, for you, this exile is not so bad. And you feel you are doing whatever you can about it, anyway. But it is not just you alone in exile. Abraham, Isaac and Jacob and all the generations of their children, as well all the heavenly host—in fact, the entire creation—all is unfulfilled, in exile and imprisoned. Even the Creator, blessed be He, locks Himself into prison along with His creation. Until you get us out of here. As you read this, Tisha B’Av is less than a day in the past and yet once you have fully entered a period of mourning, is it so easy to hold back the tears at its end? Not only should we be grieved at our loss but we should be ashamed of our sins. We should repent and repent quickly for our master the King could return at any moment. Let them construct a sanctuary for Me, that I may dwell among them. According to all that I am going to show you, as the pattern of the tabernacle and the pattern of all its furniture, just so you shall construct it. I recently wrote a commentary on these verses relative to where and how we come close to God, but the more plain meaning of the text tells us something wonderful. It tells us that God laid out the pattern, the blueprint if you will, of the Heavenly Temple Court for Moses and instructed him to construct what amounts to a scale model of the Heavenly Court on Earth in the form of the Tabernacle. For everything in the Tabernacle and about the Tabernacle was an earthly replica of the Heavenly originals…everything…and everyone. That means every object you see described in Exodus that is used in the Tabernacle has a counterpart in Heaven. It also means that every person, the High Priest, the other Aaronic priests, the Levites, everyone, have Heavenly counterparts. Imagine. Just think. If you’ve ever visited Jerusalem and particularly the Old City (sadly, I have not), then you could choose to see just the streets and stones and tourists, or you could allow yourself to envision Jerusalem as a sort of earthly reflection (though a mirror dimly) of the perfected Jerusalem. And even though we don’t currently have the Temple with us, we know from Ezekiel that we will, and that when it existed and when it will exist again, every action of every one of the Priests on Earth will be a reflection of the Angelic Priests in Heaven. What is it like when an Angel offers incense on the altar before God I wonder? We know from the two previous sermons in this series, Melchizedek and The Bypass that Yeshua (Jesus) is the High Priest in the Heavenly Temple. We have to believe that there are also Angelic Priests who attend and assist him in his priestly duties, just as God commanded the earthly Priests to assist and attend the Aaronic High Priest. We also learned during these prior sermons, that the earthly Tabernacle and later Temple and the earthly Priesthood were considered “weak” only because they could not deliver what the Heavenly Temple and Priesthood do: permanent absolution from sin and resurrection immortality. But then the earthly Temple and Priesthood weren’t designed to do any of those things. I’ve been exploring how Torah observance was never, ever meant to justify anyone before God in my Reflections on Romans series, so this is certainly a parallel. At this point, Lancaster is finished with his introduction and proceeds to read Hebrews 8:1-5. So we have such a High Priest in Yeshua in the Heavenly (original and eternal) Temple, who is a “minister” in the “true tabernacle” which was “pitched” not by man but by God. Yeshua, of the tribe of Judah and the house of David, would not be a Priest on Earth and will not be when he returns. 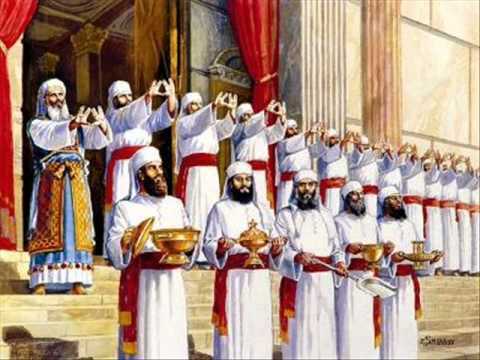 He does not overturn or override the Law of the Temple, since only Aaronic Priests of the tribe of Levi may serve there (and will serve there in the Messianic Age). Yeshua’s priesthood doesn’t replace the Levitical priesthood, it exists altogether separately in a completely different venue. Now the king and all Israel with him offered sacrifice before the Lord. Solomon offered for the sacrifice of peace offerings, which he offered to the Lord, 22,000 oxen and 120,000 sheep. So the king and all the sons of Israel dedicated the house of the Lord. On the same day the king consecrated the middle of the court that was before the house of the Lord, because there he offered the burnt offering and the grain offering and the fat of the peace offerings; for the bronze altar that was before the Lord was too small to hold the burnt offering and the grain offering and the fat of the peace offerings. Yeshua will be the great King and perform duties in relation to the Third Temple just as Solomon the King inaugurated the first Temple. Here’s where we encounter what Lancaster calls “Christian theological bias.” When we read “copy and shadow,” we’ve been taught in the Church to think “empty,” “meaningless,” “vain,” and even “forgery.” We’ve been taught that all that “stuff,” the Temple, the Priesthood, the sacrifices, and of course, the Torah (Law) had a temporary use but it was all meant to expire and be replaced by the Holy, Heavenly, originals and specifically by Jesus, the High Priest of our hearts, for we replace the stone Temple as little, flesh and blood, spiritual temples. Some background. Lancaster says this was part of Paul’s argument against the ascetics, those people who believe that one can only be spiritual by disdaining anything that might be physically pleasurable and imposing severe self-discipline and abstention upon themselves. While there are some practices in Judaism that follow an ascetic pattern (Tisha B’Av and Yom Kippur), the majority of Jewish observances (and remember, Paul was an observant Jewish Pharisee who advocated for Jews in Messiah performing the mitzvot, including Shabbat and the Festivals) such as Pesach (Passover), Shavuot (Festival of Weeks), Sukkot (Festival of Booths), and Shabbat (the Sabbath) were and are celebrated largely by eating and drinking. This could well support Gentile Christian observance of the Biblical holidays in the present age since Yeshua (Jesus) was not just speaking of Israel but of the people of the nations “from the east and the west”. If you or I as non-Jewish disciples of the Jewish Messiah were to keep a proper Shabbos, observe the festival of the New Moon, and build a sukkah in our backyard this fall, in performing each of these acts, we are also experiencing a “shadow or copy,” a scale model, a brief tasty little treat of the magnificent banquet that we will be permitted to join in the Messianic Age. So shadows and copies aren’t cheap knockoffs or poor imitations that need to be cleaned out to make way for the originals. They are previews, coming attractions of the main event, like watching the previews of a biggest, best movie ever to be made in anticipation of one day seeing the entire film in 3D. I put in bold the words “were” and “however” in the first quote and the word “mere” in the second. Why? Because Lancaster says they don’t exist in the Greek. Later translators added those words to insert an anti-Torah bias into the text. If you just read and understand the Bible in English (or probably a lot of other translations), you’ll completely miss it. These are a shadow of what was to come; the substance is the Messiah. Unfortunately, it still uses the word “was” which isn’t in the Greek. 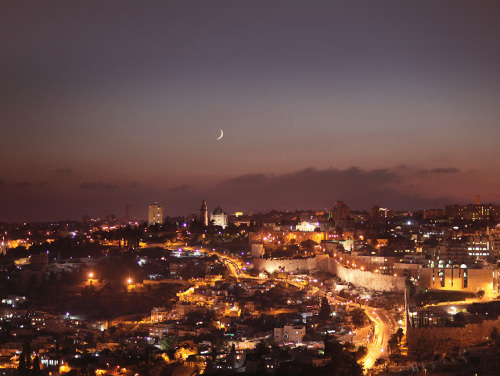 The Shabbat, Rosh Chodesh, and the other observances are shadows cast by the Holy observances that will enter our world with the Messiah’s return. They are not past, they are present and future. In other words, the Shabbat, Rosh Chodesh, Passover, Shavuot, Sukkot are all tasty hints and treats, samples from the dessert tray, so to speak, of what is to come, but the full meal deal, so to speak, is the Messiah. Yes, he is the full substance, but we have been provided with previews so we can look forward to what’s coming and experience some of that wonder and delight in the here-and-now. I felt I already had a pretty good handle on Hebrews 8:1-5 from the background of my general knowledge plus Lancaster’s prior sermons, but what I didn’t expect was how Colossians 2 was so easily applied to the same usage of “copy and shadow.” I was also unconscious of how modern Christian translators have been guilty of some “hanky-panky by apparently playing fast and loose with the oldest Greek manuscripts we have of the text, inserting anti-Torah, anti-Festival, and anti-Jewish bias into Christian minds and hearts. Face it. Most of us don’t read the Bible in the ancient languages and we rely upon our English Bibles. I find great meaning and truth in the Bible, but on some level, I also feel betrayed. This is a good illustration as to why we must learn to educate ourselves and not depend solely upon traditional Christian learning sources. It’s not even that anyone is lying, but the history of the Church is fraught with traditions stemming from the earliest days of Gentile Christianity, when every effort was made by those pulling away from their Jewish teachers and mentors in the Messianic faith to re-interpret the scriptures in a manner that rendered them totally devoid of their original (Jewish) meaning and truth. Small wonder most Jews really hate Paul. They’ve learned to interpret him in exactly the same way as most Evangelical Christians, only Christians see Paul’s (supposed) anti-Torah writings as a virtue rather than a curse. I hope you conclude, as I have, that there is nothing about the Heavenly Malkizedekian Priesthood or the Heavenly Tabernacle that undoes, makes obsolete, or terminates the effectiveness and authority of the Torah, the Temple, and the Priesthood here on Earth. 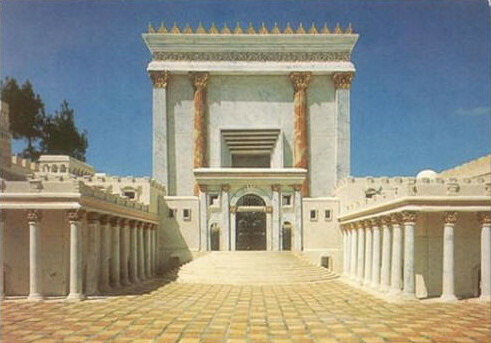 When Messiah does return and rebuild the Temple (actually, the Temple Mount is too small to hold the Temple described by Ezekiel, so the geography of Jerusalem is going to have to change somewhat), those Torah Laws that govern the Temple, the Priesthood, and the sacrifices that have been put into abeyance for nearly twenty centuries will be applicable again. Until that day however, we remain in exile with just the periodic precursors of the age to come to comfort us. From the day that Jerusalem and the Holy Temple were destroyed, there is no joy before G-d… until Jerusalem will be rebuilt and the Jewish People will return to it. From my father’s sichot: When Mashiach will come (speedily in our time, amein), then we shall really long for the days of the exile. Then we will truly feel distress at our having neglected working at avoda; then will we indeed feel the deep pain caused by our lack of avoda. These days of exile are the days of avoda, to prepare ourselves for the coming of Mashiach, speedily in our time, amein. -from Tanya: Ch. 11. This subject (p. 379) …infinitely more so. (p. 381). How long, Moshiach? How long? James: You wrote They are previews, coming attractions of the main event, like watching the previews of a biggest, best movie ever to be made in anticipation of one day seeing the entire film in 3D. and In other words, the Shabbat, Rosh Chodesh, Passover, Shavuot, Sukkot are all tasty hints and treats, samples from the dessert tray, so to speak, of what is to come, but the full meal deal, so to speak, is the Messiah. Yes, he is the full substance, but we have been provided with previews so we can look forward to what’s coming and experience some of that wonder and delight in the here-and-now. Not quite sure what you’re getting at, Alfredo. I’m saying that the Festivals are earthly equivalents of Heavenly events. If you think the moadim are great now, just wait until the Messianic Kingdom. What I mean is that I agree with you about how these Moadim are previews, tasty hints, treats, samples and also agree that the full deal is ahead of us… that is why I think that the word מקרא (miqrâ’) also plays a big role to take into account, with it’s meaning about all these being a rehearsal… a rehearsal for us to be ready for the BIG events that these Moadim point at. Even as gentiles, I think we must try to go along with Israel, not trying to take anything away from them, but being happy and sad with them when each of these Moadim are celebrated. And I do believe that in rabbinic literature there are teachings that allow a space for gentiles to join Israel in some of those occasions. I do try to keep the Messianic Kingdom in mind every time I celebrate any of the Moadim. I don’t think there’s an objection to Gentiles coming alongside Israel in solidarity and taking on board additional mitzvot. The only objection is claiming full obligation and/or attempting to convince others that Gentiles are now Jews. 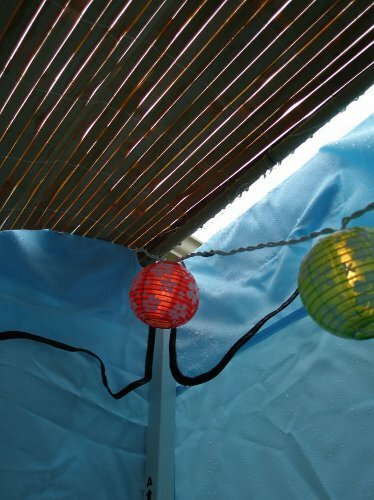 I see no harm in keeping some form of kosher, lighting Shabbat candles and building a sukkah in your backyard. 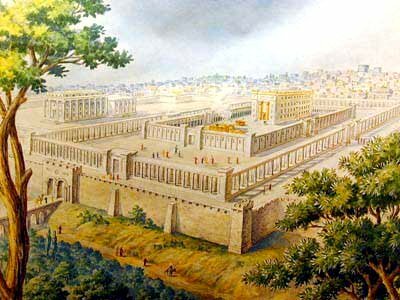 What are the scriptures that people take to mean the third temple must be built when the Messiah comes but not before?